(Oregon Coast) – The origin stories of Oregon coast places can be a serious wild card. You never know what you’ll discover as you dig a bit deeper, and the finds aren’t always easy. Sometimes they’re a bit of a jolt and they knock you out of some assumption you previously had about a place, and this new realization takes a bit of getting used to. But in the end, it’s simply a surprise. Other times, you uncover something uncomfortable and uneasy. (Above: Seaside around 100 years ago). Sometimes, the truth about even the Oregon coast is uneasy. Here are seven such examples that range from surprises to disturbing. Seaside, Town of the Tycoon. If you think Seaside was named after the fact it was next to the sea, you’re only partially correct. 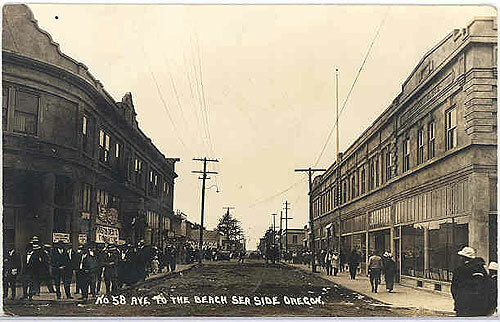 Indeed, the north Oregon coast resort town was just that from the very beginning: a sprawling complex called the Sea-Side House was built here back in 1871 to serve the extremely rich. It had a race track and a host of other amenities that outshone that of its more established neighbor to the north: Astoria (founded by the really wealthy Astor family). The Sea-Side House came about shortly after railroad tycoon Ben Holladay visited the area on a hunting expedition. He was immediately drawn to the place and created this Italian villa-style hotel. In 1899, when founding fathers of the city were looking for a name, they snagged Seaside instead of anything else. If it was out of honor to Holladay or being bought by him is anyone’s guess, but in the end Holladay got a whole avenue named after him as well. Where in the World is the Shipwreck? Manzanita is known for a lot of shipwreck lore, including one going back all the way to the 1700s. One shipwreck, called the Glenesslin, caused a stir here about 100 years ago. From the Neahkahnie vantage points, if you look down at the rocks from the right spot, you can supposedly see part of the Glenesslin. Actual documentation of this is rare, however. But some locals swear they’ve seen the crusty chunks of the old ship. Rocks of Many Ages. Rockaway Beach’s Twin Rocks are actually a geologic surprise. About 18 million years ago, there was a volcanic eruption so heavy it burrowed into the ground and came up again as a re-eruption. It’s technically known as an intrusive. All this area was ocean then – the beach was at least 20 miles east. Cannon Beach’s Haystack Rock was created the same way. Stairway of a Thousand Steps. Next to Oceanside, Short Beach is a monstrously cool beach hiding in plain sight. But before 18 years ago it was dangerous to get to, with just a slippery slope where people cracked their heads often. 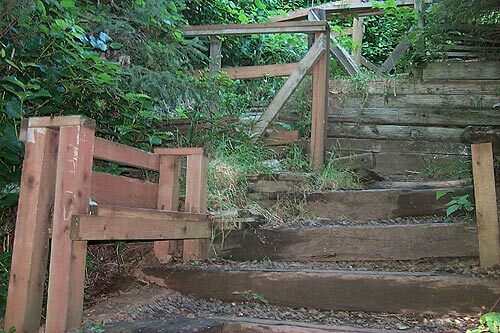 Locals tired of this and funded the “stairway of a thousand steps.” It does indeed feel like a thousand steps, but it’s safer now. Goig back farther: in 1925, locals built an elevated wooden walkway around Maxwell Point, which really stirred up tourism to tiny Oceanside. This was a truly unsafe construct, doomed to destruction by winter storms. Sometimes called an “angel walk,” it didn't take long to crumble. Apparently, another such construct was built to gain access to Lost Boy Beach on the other side of the beach, only lasting a short time. Lincoln City's Name Wars. Lincoln City was very nearly called Surfland. Back in 1964, when the town was formed, those who wanted the name Surfland, Oregon were almost a majority and came precariously close to winning in a vote. There’s some talk the name was already decided in back room deals, however. It was a vote in ‘64 that officially made the city Lincoln City. Since then, other efforts have resurfaced to change the name again, including one in ‘67 that was very close as well. In subsequent decades, others again tried to change the moniker of the famed Oregon coast town to Lincoln Shores and even Beach City. Newport's Disappearing Act. Parts of Newport are crumbling rather quickly. The rocky nubs you see at the tideline (in the video) were once where the cliffs came up to. 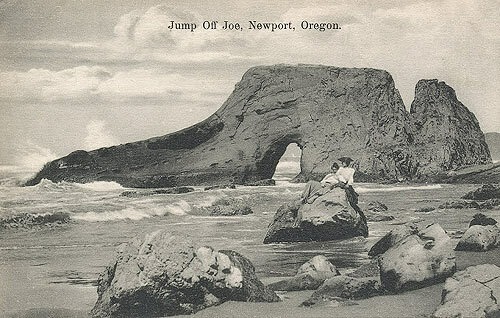 About 100 years ago, those blobs were part of a much-loved structure called Jump-Off Joe, which was huge. It disappeared into the tides within 30 years of being disconnected from its parent cliff. Now that cliff with the ruins of a condo has the name Jump-Off Joe, and most of that cliff has disappeared since the ‘90s. Somber Side to Yachats. Here’s a creepy fact: Yachats was the scene of a kind of genocide back around 170 years ago. What happened to native Americans because of white settlers is routinely ignored in U.S. schools, such as the forced march of various tribes from the southern Oregon coast to the Yachats area in the mid 19th century. It was another case of the U.S. government forcibly moving native peoples around after signing fake treaties and shifting them from one reservation to another. The big one happened in the 1860s, some 80 miles that rivaled the death march of Bataan in World War II.